As Precision Medicine is taking off, the number of samples in a testing lab and the associated data volume is increasing exponentially. In order to organize the data and build a knowledge base of cases that can be used for future analysis as well as ongoing research, labs need to leverage state of the art warehousing technology. 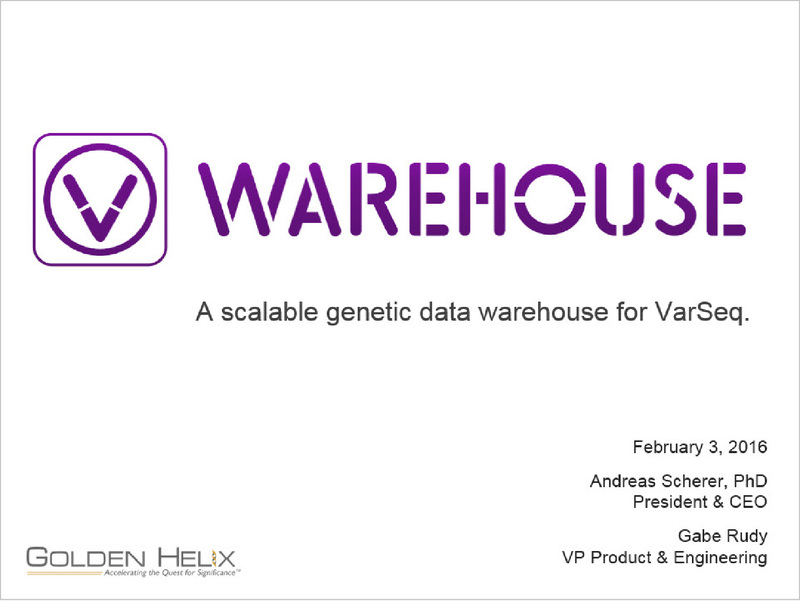 Building on the algorithms and high-performance storage technology powering the VarSeq software, we introduce VSWarehouse: a scalable, multi-project warehouse for NGS variant call sets, clinical reports and catalogs of variant assessments. Have I ever seen this variant in my previous test samples? Have I put this variant into a clinical report for any previous samples? What notes have I take about this variant? What has changed in public databases like ClinVar since I last assessed this variant? These questions can be answered by an integrated variant warehousing solution that never throws away any data from sample VCFs or their genomic annotations, even as new samples and updated annotations are added. Furthermore, a single repository of clinical samples allows for retrospective cohort research studies as well as systematic alerting for changes in public annotations that warrant review of previously reported decisions. Please join us to learn about how Golden Helix is tackling this important component to any testing lab's infrastructure and hear about a special offer for early adopters. Gabe Rudy is GHI's Vice President of Product Development and team member since 2002. Gabe thrives in the dynamic and fast-changing field of bioinformatics and genetic analysis. Leading a killer team of Computer Scientists and Statisticians in building powerful products and providing world-class support, Gabe puts his passion into enabling Golden Helix's customers to accelerate their research. When not reading or blogging, Gabe enjoys the outdoor Montana lifestyle. But most importantly, Gabe truly loves spending time with his sons and wife. Follow Gabe on Twitter @gabeinformatics. Dr. Andreas Scherer Dr. Andreas Scherer has managed global software and services businesses working for publicly traded companies such as Netscape and AOL as well as privately held companies. As part of his academic work, he has developed algorithms to conduct DNA sequence analysis. In the last decade, he has focused on accelerating R&D processes of Fortune 500 pharmaceutical, biotech, and medical device companies. As a result of this work, he is intimately familiar with the domestic and international life sciences market. Dr. Scherer holds a PhD in Computer Science from the University of Hagen, Germany, and a Master of Computer Science from the University of Dortmund, Germany. He is author and co- author of over 20 international publications and has written books on project management, the Internet, and artificial intelligence. His latest book, "Be Fast Or Be Gone," is a prizewinner in the 2012 Eric Hoffer Book Awards competition and has been named a finalist in the 2012 Next Generation Indie Book Awards. Follow Andreas on Twitter @andreasscherer or connect with him on LinkedIn.